1. Heat oven to 425°F. Grease 13x9-inch (3-quart) glass baking dish with shortening or cooking spray. Remove 1 pie crust from pouch; unroll on work surface. Roll into 13x9-inch rectangle. Place crust in dish; trim edges to fit. 2. In large bowl, stir corn syrup, brown sugar, butter, vanilla and eggs with wire whisk. Stir in chopped pecans. Spoon half of filling into crust-lined dish. Remove second pie crust from pouch; unroll on work surface. Roll into 13x9-inch rectangle. Place crust over filling; trim edges to fit. Spray crust with butter-flavor cooking spray. 3. Bake 14 to 16 minutes or until browned. Reduce oven temperature to 350°F. 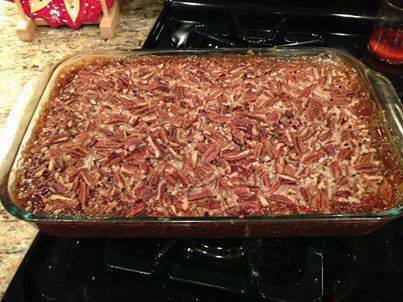 Carefully spoon remaining filling over baked pastry; arrange pecan halves on top in decorative fashion. Bake 30 minutes longer or until set. Cool 20 minutes on cooling rack. Serve warm with vanilla ice cream.